Arguably this is the first time ever in the history of our country or from anywhere in the South Pacific where two of Fiji’s heavyweights are seen together on the international arena and holding their own among world leaders. They are our very own Prime Minister Voreqe Bainimarama and incoming President of COP23 in Bonn, Germany, and the President of the United Nations General Assembly, Peter Thomson. So it was a great picture on Fiji Sun’s front page (FS 16/04) to see our leader with Russia’s very own Vladimir Putin. 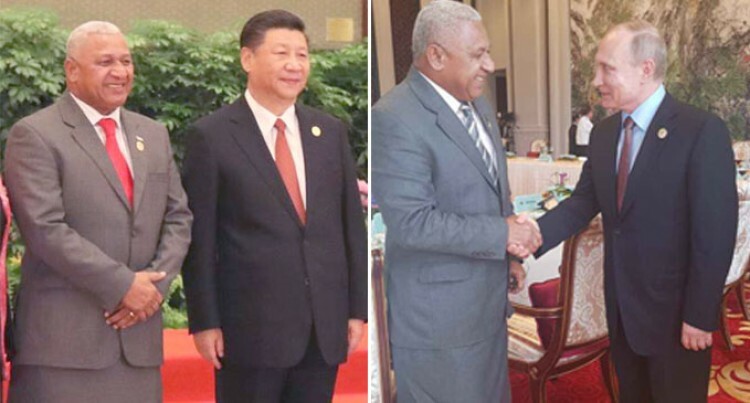 It was taken during the Belt and Road Forum for International Co-operation in Beijing, China, “A great Fijian Leadership”. It is inspirational for our young future Fijians. Mr Bainimarama was also a former chair of the G77 and he is also the former chair of the UN’s International Sugar Forum. The world’s International Monetary Fund (IMF) managing director, Christine Lagarde, is also full of praise for our PM in his role as COP23 president. They must be doing something right that most of us Fijians and his critics can’t see. Well done gentlemen. It is indeed a note-worthy achievement for small island nations and you are definitely punching above your weights. This is a very delicate topic as I have family links with the deceased, but I have put my feelings aside in an effort to find a solution to such situations. I am certain the lady would be looking over me and encouraging me to do it. There were no ambulances available at the time. I am a taxi driver and was called one morning two months ago to go and pick up a lady from Valelevu, who was in a lot of pain and needed to be rushed to the Colonial War Memorial Hospital. We left the house and made our way to the main road around 7.10am. This took some time because of the traffic jam. We got on the main road and then moved towards Suva at a snail’s pace. I had my hazard lights and head lights on, but no one took notice or gave way. In the meantime, my passenger was struggling to breathe and in a lot of pain and we continued to crawl at a snail’s pace. This continued all the way with her relatives holding her up and appealing to her to stay awake. We lost her about 8.20am in front of the Manohan Building, Centre Point. I was tempted to run the lane leading out of Suva which was empty most of the way but my concerns were if we got involved in an accident, I could lose my licence and my permit. I am sure had we done that maybe, and I say maybe, we would have saved her life. Only God knows. I recall doing this many years ago and we saved the passenger, but it was in my private car. I am appealing to the Minister for Transport, the Commissioner of Police and the chief executive officer of LTA to please assess this scenario and find an amicable solution to be able to get a sick person to the hospital during peak traffic. I am suggesting rushing with your hazard lights and your car lights all on and where possible the horn blaring and approaching a traffic jam situation, the car is allowed to manoeuvre like how an ambulance would on both sides of the traffic. Gentleman, I seek your humble urgent attention on the above matter in the hope that others in the same scenario does not go through a similar situation. Is there a need to review movie ratings before they are screened at local cinemas? With all due respect, a current movie about a legendary king, had packed audiences this weekend, including many children. Just as entertaining the movie was, one may also consider it quite spooky and scary at times leaving children scared. Some children may have ended up having nightmares. One adult described some scenes and music as evil. At the end of the day, it is an individual choice including what parents allow their children to watch. Government Members of Parliament and its Opposition seem to be going full force trying to sell their promises to the people. I believe it is a good time for all Fijian citizens to really have a good think, analyse and see if what these politicians are promising goes hand in hand with their qualities, integrity and performances so far. As I’ve said before politics is full of poli-tricks. Beware of those wolves in sheep’s clothing who will sell anything even if its breaking the law just to win our vote. Our future and the future of our children will depend on it. Choose wisely!